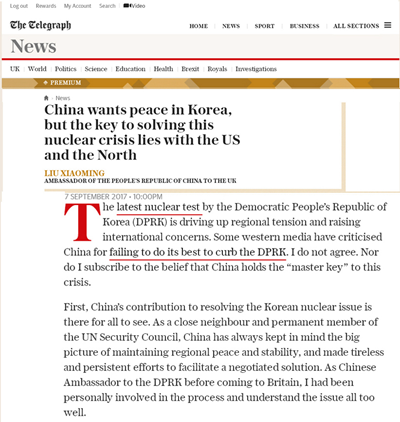 The Daily Telegraph Publishes a Signed Article by Ambassador Liu Xiaoming Entitled " China is not the key to North Korean Crisis "
The latest nuclear test by the Democratic People's Republic of Korea (DPRK) is driving up regional tension and raising wider international concerns. Some western media have criticised China for failing to do its best to curb the DPRK. I do not agree. Nor do I subscribe to the belief that China holds the "master key" to this crisis. First, China's contribution to resolving the Korean nuclear issue is there for all to see. As a close neighbour and a Permanent Member of the UN Security Council, China has always kept in mind the big picture of maintaining regional peace and stability, and made tireless and persistent efforts to facilitate a negotiated solution. 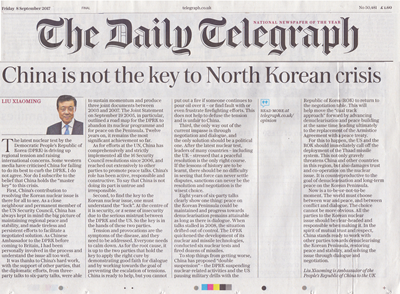 As Chinese Ambassador to the DPRK before coming to Britain, I had been personally involved in the process and understand the issue all too well. It was thanks to China's hard work, with the support of other parties, that the diplomatic efforts, from three-party talks to six-party talks, were able to sustain momentum and produce three joint documents between 2003 and 2007. The Joint Statement on 19 September 2005, in particular, outlined a road map for the DPRK to abandon its nuclear programme and for peace on the Peninsula. Twelve years on, it remains the most significant achievement so far. As for efforts at the UN, China has comprehensively and strictly implemented all the 16 Security Council resolutions since 2006, and reached out extensively to other parties to promote peace talks. China's role has been active, responsible and constructive. To say that China is not doing its part is untrue and irresponsible. Second, to find the key to the Korean nuclear issue, one must understand the "lock". At the centre of it is security, or a sense of insecurity due to the serious mistrust between the DPRK and the US. So the key is in the hands of these two parties. Tension and provocations are the symptoms of the disease and they need to be addressed. Everyone needs to calm down. As for the root cause, it is up to the two parties that hold the key to apply the right cure by demonstrating good faith for dialogue and by working towards the goal of preventing the escalation of tensions. China is ready to help, but you can not put out a fire if someone continues to pour oil over it, or find fault with or even frustrate firefighting efforts. This does not help to defuse the tension and is unfair to China. Third, the only way out of the current impasse is through negotiation and dialogue, and the only solution should be a political one. After the latest nuclear test, leaders of many countries, including the UK, stressed that a peaceful resolution is the only right course. If the lessons of history are to be learnt, there should be no difficulty in seeing that force can never settle disputes, sanctions can never be the end, and negotiation is the wisest choice. Eight years of six-party talks clearly show one thing: peace on the Korean Peninsula could be maintained and progress towards denuclearisation remains attainable as long as there is dialogue. When talks stalled in 2008, the situation drifted out of control. The DPRK quickened the development of its nuclear and missile technologies, conducted six nuclear tests and fired dozens of missiles. To stop things from getting worse, China has proposed "double suspension" – the DPRK suspending nuclear-related activities and the US pausing military drills with the Republic of Korea (ROK) to return to the negotiation table. This will help move the "dual track approach" forward by advancing denuclearisation and peace building at the same time, leading ultimately to the replacement of the Armistice Agreement with a peace treaty. For this to happen, the US and the ROK should immediately call off the deployment of the Thaad missile system. This not only gravely threatens China and other countries in this region but also damages trust and cooperation on the nuclear issue. It is counterproductive to the goal of denuclearisation and long-term peace on the Korean Peninsula. Now is a to-be-or-not-to-be moment. The world must choose between war and peace, and between conflict and dialogue. The choice cannot be more obvious. All the parties to the Korean nuclear issue should be clear-headed and responsible when making it. In the spirit of mutual trust and respect, China stands ready to work with other parties towards denuclearising the Korean Peninsula, restoring peace and stability, and solving the issue through dialogue and negotiation.